A young West Ham striker has died after a three year battle with testicular cancer. 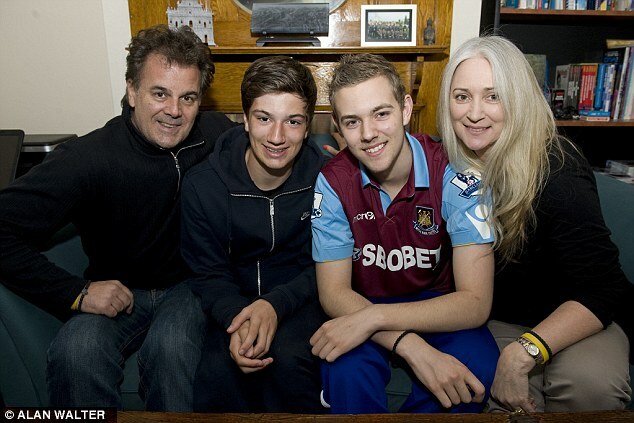 Dylan Tombides, 20, passed away today with his family at his bedside. The Australian footballer was first diagnosed with cancer while representing Australia during the 2011 Under 17 World Cup in Mexico. 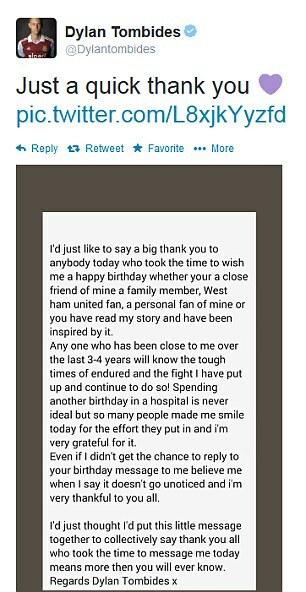 Tombides was diagnosed with cancer in 2011 and he died today with his family at his bedside. He fought the disease for three years but has sadly lost his battle. West Ham released a statement which read: ‘West Ham United announce the sad news that forward Dylan Tombides has passed away at the age of 20 following his brave battle with cancer. After being diagnosed with cancer he battled back to make his first-team début in a League Cup match against Wigan in 2012. His death will be marked by a minute’s applause before West Ham’s home match against Crystal Palace this weekend. Tombides was viewed as one of the best players to come out of Australia. 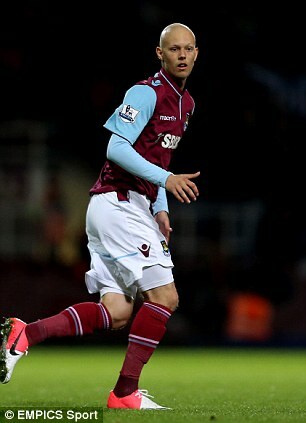 Tombides was told he has cancer while in Cancun, Mexico, with his father. A random drugs test following a match against Uzbekistan has uncovered a tumour on one of his testicles. In an interview he explained: ‘I was 17, a young man and I had never come across cancer. All I was thinking about was getting in the West Ham team and taking my driving test. ‘All I ever wanted to be was a top professional footballer with West Ham. I copped one in my groin against Brazil at the World Cup and I knew that I had a problem, but I had no idea it was cancer. ‘It was only when I took the phone call in Cancun that I realised just how serious the condition was. FIFA president Sepp Blatter led the messages of condolences to Tombides’ family tweeting: ‘My thoughts & prayers are with the family of Dylan Tombides’. Tombides has a 45 minute operation to remove the tumour and then spent weeks in St Bartholomew’s Hospital, London, having chemotherapy. His mother, Traceylee, said in an earlier interview: ‘It was a period of helplessness. As a parent we wanted to protect our kids, but we had no control. Testicular cancer is most common in men aged 15 to 44 and affects 2,000 each year in the UK. The most common symptom is a lump or swelling in one testicle, but 20 per cent of patients also experience pain in their testicles or lower abdomen. A feeling of ‘heaviness’ in the scrotum is another symptom. People with an undescended testicle have a greater risk of testicular cancer as do people with a family history of the disease. It is five times more common in white men than in black men and is also more common in tall men. It is one of the most treatable cancers – 97 per cent of patients survive for more than five years after diagnosis. In it’s statement the club added: ‘Dylan’s amazing resilience and positivity saw him through months of surgery and chemotherapy, while his outstanding talent saw him make his first-team début in a League Cup tie with Wigan Athletic at the Boleyn Ground in September 2012. ‘Away from the pitch, Dylan did a huge amount of work to raise awareness of male cancer, supporting the One for the Boys campaign at a number of high-profile events alongside the likes of Hollywood star Samuel L. Jackson, snooker star Jimmy White and fellow Australian Peter Andre. ‘Dylan was respected by everyone who knew him for his intelligent views on the game and his larger than life character. ‘He was a loving son, amazing brother and well-respected member of the West Ham squad. He will be hugely missed by everyone who had the honour of knowing him. ‘His passing will be marked by a minute’s applause ahead of Saturday’s Barclays Premier League fixture with Crystal Palace at the Boleyn Ground. The Hammers’ players will also wear black armbands in his memory. ‘The thoughts of everyone associated with the club are with his parents Tracylee and Jim, brother Taylor, his family and friends at this sad time. John Hartson, 39, was diagnosed with testicular cancer in 2009. The former Arsenal and West Ham United player was given chemotherapy because the cancer had spread to his brain and lungs. The treatment was successful and in December 2009 it was reported that the cancer had been virtually eradicated from his body. Despite this, he was told he would need more treatment. Neil Harris, a Millwall and Southend player, was diagnosed with the disease in 2001. He was diagnosed after noticing that one of his testicles felt larger than the other. He had surgery and radiotherapy and says he was lucky because his cancer was caught early. He returned to playing football just months after his diagnosis. Alan Stubbs, 42, who played for Bolton Wanterers, Celtic, Everton, Sunderland and Derby County has battled cancer twice. He initially had testicular cancer and then a tumour was found at the base of his spine. He has now been free of cancer for more than 10 years. Chris Anderson, a Spartans striker, was diagnosed with testicular cancer last year. After eight months of treatment he was given the all-clear. This entry was posted in Cancer, Cryoablation, Kidney Cancer, Magnetic resonance imaging, Surgery, Testicular Cancer, Tumour and tagged Dylan Tombides, GL-W, Greg Lance-Watkins, Greg_L-W, Testicular Cancer, West Ham. Bookmark the permalink.